Tatiana Cigars are one of the leading flavored cigars in the world. Crafted from high quality Dominican tobacco and an Indonesian wrapper, every Tatiana cigar is expertly finished with premium quality flavors. The end result is a smooth cigar which will delight your senses and fill the room with a wonderful aroma. Tatiana Night Cap was blended with coffee-lovers in mind. Each is flavored with a unique mix of vanilla, Marcona almonds, Arabica coffee, and rare Criollo cocoa. 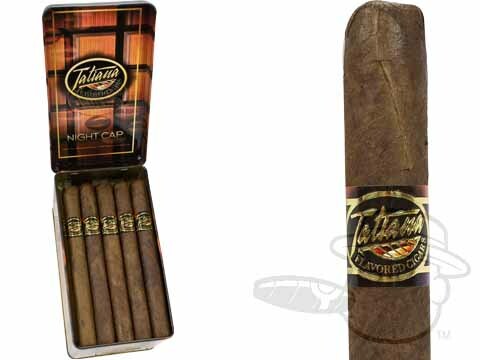 Tatiana Classic Night Cap delivers its creamy, eye-opening essence through a traditional 6x44 Lonsdale vitola. My husband enjoy the cigars. And their customers service was excellent because we some damage done to the container the cigars and they fix the problem very well. I don't know exactly what the flavor is, but it goes perfect with a brandy or even a scotch. This is my go-to cigar choice. The flavor is very mild and sweet. The Tatiana Line NEVER DISAPPOINTS... GREAT CIGAR ... GOOD PRICE... FAST and INFORMED DELIVERY!!! I bought these because I like a mild to medium smoke these are perfect for me. I especially like them later in the evening after a meal wonderful night cap. Puts out very good smoke very light smoke. However the down side was I can only punch them because the construction is very loose and if I do a straight cut I will be spitting out tobacco with every puff which of course is not good. It would be wonderful if the role could be a little tighter and I don't always have to punch. Great cigar to enjoy while relaxing and watching sporting events on TV. Enjoy the mild flavor of this cigar. Great cigar for the ladies. Love these little treats. Perfect evening ended. Got this in Pete's sampler. Took it out if wrapper and had a wonderful smell. After lighting it the smell was even better. Easy draw and slow burn. Only issues was loose wrap and I cut so spitting pieces as I smoked. No matter for the price I will definitely buy again. This one is a keeper! Best cigar I've ever had, wonderful aroma before lit, and after lighting it tastes every bit as good as it smells. Tatiana Classic Night Cap is rated 4.3 out of 5 based on 24 customer ratings.